Two men, two leaders: one destiny.” The video the White House created to mark this week’s summit between US President Donald Trump and North Korean leader Kim Jong-un cast the two men as heroes of a Hollywood film. Everything about the video, a self-described “Destiny Pictures Production” complete with soaring background music and a dramatic voice over, oozed stratospheric levels of optimism. This positivity was promoted as the guiding theme of Tuesday’s summit in Singapore. The mere existence of the meeting was historic: Donald Trump is now the first sitting US president to meet with the leader of North Korea. The two men held a string of private meetings and were all smiles in the many choreographed photo-ops before the world’s press. The day culminated in the men signing an agreement recognising that the summit was an “epochal event of great significance” in overcoming decades of tension between the US and North Korea. 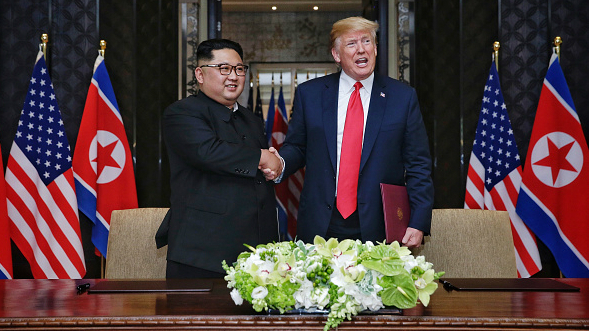 The document had four key points: the two nations committed to a “new relationship” predicated on “peace and prosperity”; to cooperate on building a “peace regime on the Korean peninsula”; Pyongyang reaffirmed that it would “work toward complete denuclearisation of the Korean Peninsula”; and the US and North Korea pledged to return the remains of captured or missing soldiers (POW/MiA) from the Korean War in the 1950s. This was followed by a revelation in the post-summit press conference that Mr. Trump had also agreed to suspend US-South Korean military exercises. Mr. Kim, for his part, had apparently agreed to shut down a testing site for ballistic missile engines. North Korea has already made some moves aimed at addressing international concerns over its nuclear programme. It suspended all nuclear and ballistic missile tests in April 2018 – prior to the inter-Korean summit. In addition, it blew up the Punggye-ri nuclear test site on May 25, 2018, before press invitees from around the world. The leaders of North Korea’s East Asian neighbours were quick to laud the summit as a success. South Korean President Moon Jae-in, a pivotal figure in the recent inter-Korean talks, declared that the “two Koreas and US will write new history of peace and cooperation”. China’s Foreign Minister Wang Yi hailed China’s “indisputable” role in the process. Many observers were quick to note that China’s “freeze for freeze” idea – North Korea suspends tests in return for the suspension of US-South Korea military exercises – was agreed at the summit. Yet criticisms of the agreement’s broad language, echoing past agreements with North Korea, have come in thick and fast. “It was too short, too anodyne and too similar to everything that has come before,” says Richard Nephew, principal deputy coordinator for sanctions policy at the US State Department from 2013 to 2015. The agreement included no specific details on how the denuclearisation of North Korea would be achieved. There was no timeline for Pyongyang giving up its nuclear weapons, nor any sense of how the international community would work to verify that it had been accomplished. Commitments on the part of the US to “security guarantees” for the Kim regime were similarly opaque. “While we have seen countries give up their nuclear ambitions, we have never seen a country give up its nuclear weapons before – at least a country that we know has nuclear weapons,” Sara Z. Kutchesfahani, senior policy analyst at the Centre for Arms Control and Non-Proliferation, told TWW. This “unprecedented” process would require the US and its partners to verify progress at a host of sites including “nuclear and missile facilities, test sites, enrichment capacity, and retention of research and data”. Speaking to the world’s press after the summit, Mr. Trump claimed that there had been “no time” to include these details in the agreement. He stressed he believed Mr. Kim was committed to denuclearisation, and the process would be “verified” and happen as “fast as mechanically and scientifically” possible – but also qualified that “you can’t ensure anything”. Adding to the president’s remarks in Seoul on Wednesday, US Secretary of State Mike Pompeo told reporters that the Trump administration was hopeful for “major disarmament” in “two and a half years”. Experts stressed the lingering gulf between the two sides. “Mr. Kim’s denuclearisation is not the same as Mr. Trump’s,” James Hoare, who served as chargé d’affaires at the British Embassy in Pyongyang from 2001 to 2002, told TWW. It should be noted this criticism has not been universal. Focusing on the “banality” of the agreement, Tristan Webb, analyst at NK Pro, a North Korea analysis firm, told TWW, misses the “deeply personal commitment made by President Trump, and the close working relationship he has developed with Chairman Kim Jong-un” – key groundwork, he argues, for future progress. Indeed, he says, the document signed this week may well be “the tip of the iceberg”, and it is “highly possible that more detailed road maps are already sketched out if not finalised” in ongoing negotiations between the two sides. Irrespective of their opinion of the summit, the array of former diplomats and experts who spoke to TWW agreed that a long road lies ahead. “The follow-on staff coordination meetings will reveal how serious North Korea is about living up to the agreements,” says Timothy Heath, senior international defence research analyst at the RAND Corporation think-tank. Speaking in Seoul on Wednesday, Secretary Pompeo said he expected negotiations with North Korea to resume “sometime in the next week”. Mr. Trump is not the first US president to meet a leader of a country seemingly anathema to American values in pursuit of global stability. President Barack Obama notably met with Cuban President Raul Castro in 2016. Before him, President Ronald Reagan opened talks with Soviet leader Mikhail Gorbachev in 1985. The issue, many observers argue, is that meeting Mr. Kim gave the North Korean regime legitimacy on the international stage, seemingly without any concrete agreements in return – North Korea state media celebrated it as “the meeting of the century”. 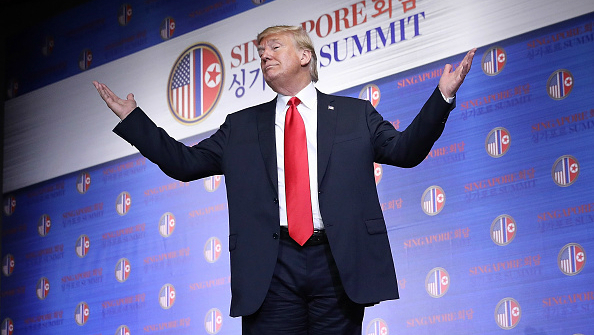 The iconography of the summit saw the North Korean and US flags together, and Mr. Kim was given a platform as a seeming equal to the president of the United States. “He’s smart, loves his people, he loves his country,” Mr. Trump told Voice of America in a post-summit interview. This celebration of Mr. Kim downplays the many human rights abuses committed in North Korea, John Sifton, advocacy director for Asia at Human Rights Watch, told TWW. Under the North Korea Sanctions and Policy Enhancement Act, the US government cannot suspend sanctions without seeing progress on both nuclear proliferation and human rights concerns. Forced labour is also believed to play a vital role in funding the nuclear programme. Mr. Trump’s brief acknowledgement at the press conference that he “raised” human rights with Mr. Kim, and his general praise for the “powerful” North Korean leader, stood in sharp contrast to his comments on traditional US allies. He continued his running attacks on fellow NATO members financial contributions to the group, bemoaned countries for “killing us on trade”, and dubbed the long-running US-South Korean military exercises “provocative” and “tremendously expensive”. In the end, Mr. Trump seems to have secured a broad-termed agreement predicated largely on trust in Mr. Kim’s good intentions going forward. In the past, similar agreements have seen North Korea quickly renege on their promises in subsequent years. Stringent economic sanctions are set to remain in place until North Korea makes concrete changes.